2. 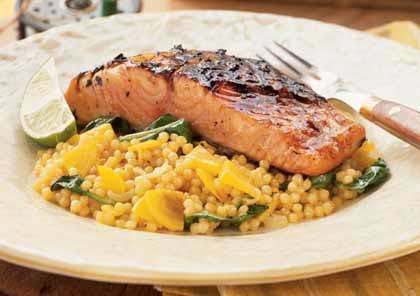 To prepare couscous, heat the olive oil in a large nonstick skillet over medium-high heat. Add shallots and beets; sauté 5 minutes or until shallots are tender and just beginning to brown. Stir in couscous; cook 1 minute, stirring frequently. Add water and salt; cover and simmer 8 minutes or until couscous is tender. Remove from heat; stir in spinach. Toss gently until combined and spinach wilts. Keep warm. 3. To prepare sauce, combine orange juice and next 6 ingredients (through red pepper) in a small saucepan, stirring well with a whisk; bring to a boil over medium-high heat. Cook for 1 minute. 4. To prepare ﬁsh, brush cut sides of ﬁllets with 1/4 cup sauce; place, skin sides up, on grill rack coated with cooking spray. Grill salmon, skin sides up, 2 minutes. Turn salmon ﬁllets; brush with remaining 1/4 cup sauce. Grill 3 minutes or until ﬁsh ﬂakes easily when tested with a fork or desired degree of doneness. Serve with couscous and lime wedges, if desired. Notes: Wild Alaskan salmon is in season this time of year, and you can ﬁnd it in supermarkets and ﬁsh markets across the country. Its rich ﬂavor is worth paying a bit more. The ponzu sauce may be made up to a day ahead and refrigerated. Golden beets add sweetness and beautiful color but don’t stain like the way red beets do. Israeli couscous has lovely pearl-like grains that are much larger than regular couscous. Use regular couscous if you can’t ﬁnd Israeli.